I asked J.M. Pasquesi to tell us some tips and information about Ancient Rome for kids. The idea came to my mind when my brother’s family went to visit Rome for the first time with the new entry Antonio: visiting the Colosseum with him was completely different! So, what to do in Rome with kids? Here’s a quick guide to read. You do have to read also Rome for kids: an insider’s guide by J.M. Pasquesi. 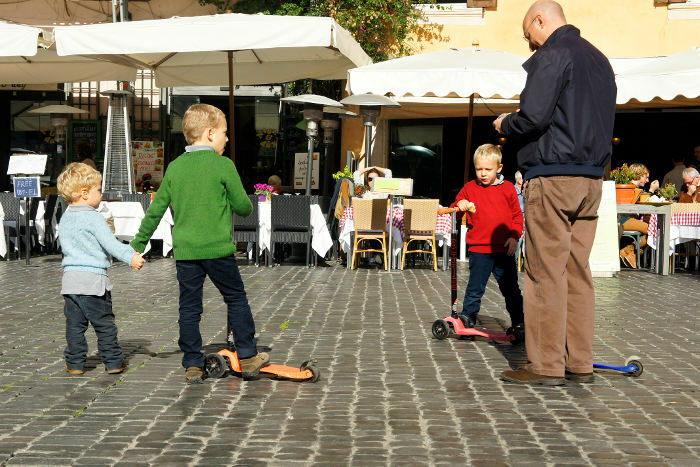 Rome is one of the best cities to tour with children because families can combine physical activity with cultural touring. Many of the attractions involve outdoor, wide-open spaces where kids can scramble around and explore. The Forums, the Baths of Caracalla, tiny Tiburina Island, and all the gorgeous piazzas and their sparkling water fountains engage all ages. The main requirements for successful touring with kids are timing, pacing, and plenty of snacks. Timing and pacing mean don’t over-schedule your days. Leave time in between touring for play and wandering. For over-crowded places, such as the Vatican Museums, time your entrance for the least busy time of day (an hour before closing usually works). And with very young children, avoid popular sites on “free” days, when they are jam-packed. In my book, Rome with Kids: an insider’s Guide, there are tips for each sight, including locations of nearby parks and restaurants. In Rome, you’re never far from a quick bite, but do keep a stash of water and snacks for micro-breaks. Water bottles can be refilled at myriad drinking fountains. Ancient Roman sites are dramatic and kids love them, just don’t lecture them for too long! Kids hate lectures. The Colosseum, for example, has all three types of Greek columns (Doric, Corinthian, and Ionic). Kids can find them or draw them in little travel notebooks. They can hunt for the Circus Maximus from the Palatine Hill, and find the belly-button of Rome (Umbilicus Urbis) in the Forum. There are loads of activities and mini-stories for each sight in RWK. It helps to share small, interesting bits on a few emperors, artists, and popes with your children before you arrive so kids can look for the family crests (depicting birds, dragons, bees, trees etc.) on fountains and buildings all over town. The main thing to understand when touring ancient Rome is that there is one ticket, which is good for two days, allowing only one entry to the Colosseum and one into the Forum/Palatine zone. To skip long ticket lines, print tickets at home and go straight to the entry. In summer visit early in the morning to avoid the heat of the day, and bring water and snacks. The Palatine Hill is a great place to let the kids run, and it has a tiny museum with a modern bathroom (free). Speaking of play, Rome’s parks offer lovely, green leafy spaces to unwind. Many of them hold playground equipment and all of them have space to picnic and play – bring a soccer ball or Frisbee. The largest central park is Villa Borghese Gardens. Parents can tour its incredible art-packed museum and then let the kids wander in search of the Borghese Zoo, the charming pond with rental boats, or the bike and surrey rentals near the Pincio Gardens, where there is also a small kiosk selling lunch, snacks and drinks. You can also enter from the top of the Spanish Steps (don’t forget to count them on the way up!). The Steps are a great example of combining touring with play. Other kid-pleasing sights include climbing the dome of St. Peter’s Basilica (then tour the inside); exploring the rooms and ramparts of Castel Sant’Angelo up to the rooftop (there is a snack bar inside and a park where the moat should be); and riding the glass elevator to the tip-top terrace observatory of the Vittoriano monument at Piazza Venezia.